I ordered beets from Elmer Farm in Middlebury and opened up a box of jewels. Spiraled orbs of Chioggia beets, garnet-hued red beets and golden beets so vivid they might have swallowed our summer sun whole. I didn’t want to steam or roast these gems, fearing they would lose their color. Instead, I took inspiration from a dish I worked one night at Zuni Café in San Francisco. That evening, one of the chefs, Joe, created a gorgeous spread of slivered beets layered with circles of grapefruit and navel orange, the plate garnished with nothing more than a pinch of flaked salt and a thin float of Prosecco. It was striking. Those colors had come straight from the ground — no dyes or droplets, just a hit of red, orange and gold on a white café plate. I shaved the beets thin, then tossed them in white wine vinegar, salt and extra virgin olive oil before laying them on a platter. I had fun with a scribble of mascarpone and a hit of fresh herbs for color, finishing with a scatter of toasted, crushed hazelnuts for sweetness and texture. I suggest a mandolin for quick, easy slicing. Behind a 10-inch chef’s knife and a flat rubber spatula, the mandolin is my third-favorite kitchen tool. I love the Benriner Japanese mandolin — you’ll find it in any restaurant kitchen, and it’s only $25 to $35. That said, feel free to go crazy with your knife-skill practice and thinly slice the beets by hand. Thinly slice or shave the beets to about 1/8 inch. In a medium-sized bowl, toss the beets with the olive oil, 2 tablespoons white wine vinegar and salt. Set aside while you finely chop your herbs. 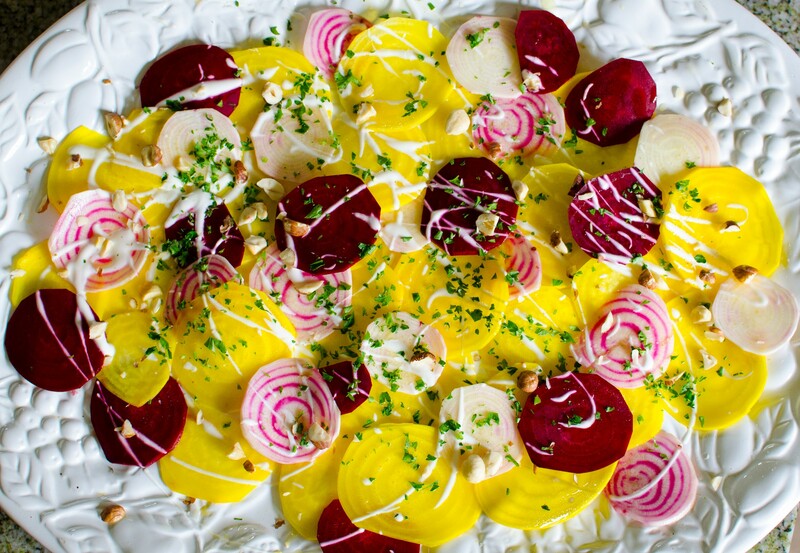 Lay beets on a wide plate. Thin out your mascarpone cheese with a bit of olive oil and 1 tablespoon white wine vinegar. Using a fork, scribble the mascarpone across the plated beets. Finish the dish with a scattering of chopped herbs and toasted hazelnuts.